Sources: Mayweather vs Pacquiao A Done Deal, Waiting For Floyd’s Announcement! Joe Latti, Brick City Boxing.com – The boxing world is certainly buzzing today as it seems we are one step closer to the mega-fight that is Floyd Mayweather vs Manny Pacquiao. A series of tweets today have informed us that negotiations are allegedly complete between the Mayweather and Pacquiao camps, and all that is left is an official announcement from Floyd Mayweather himself. The announcement of the fight was supposedly negotiated into the agreement as well, stating that only Floyd can make the announcement and it will be on his terms. Speculation suggests it will happen as soon as Friday, February 20th. Some details were also announced in regard to the potential pay-per-view agreement. The price of the event is set to increase from the most recent Mayweather and Pacquiao fights, which were $74.99 and $69.99, respectively. Mayweather has a contract with Showtime, while Manny Pacquiao is signed to Top Rank and HBO, which will lead to a joint PPV between the two networks. Both sides have reportedly agreed that aside from Mayweather vs Pacquiao, the undercard will feature one bout made by Top Rank and another made by Mayweather promotions. Although it is not officially announced, this is the closest the two sides have ever been to making the agreement. 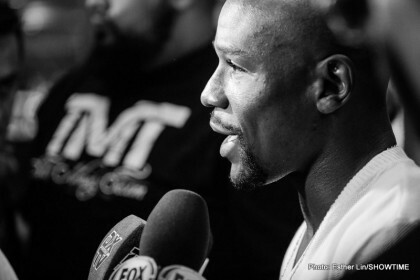 The only way we will know for sure is when we hear it from Floyd Mayweather himself. You are here: Home / Boxing News / Sources: Mayweather vs Pacquiao A Done Deal, Waiting For Floyd’s Announcement!